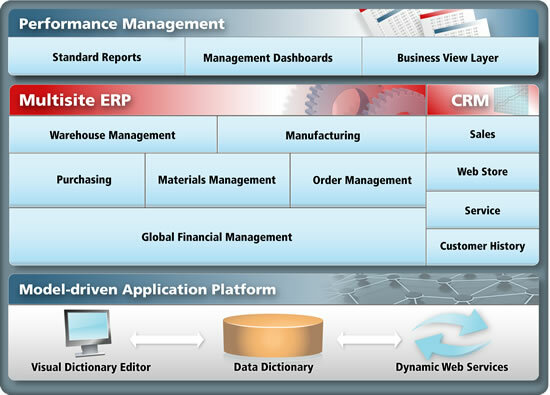 Compiere is an integrated open source ERP and CRM business solution built on a powerful Model-driven Application Platform that gives you the capabilities to run YOUR business, YOUR way. Use Compiere business solutions software to automate all of your financial, distribution, sales and service processes... quickly, affordably and easily. Compiere ERP business solution capabilities span Enterprise Resource Planning (ERP) and Customer Relationship Management (CRM). Standard Reports — Report and manage the performance of your enterprise using standard reports and integrated reporting tools. Management Dashboards — Role-based dashboards allow you to drill-down to monitor and analyze your operations more effectively. Warehouse Management —Improve warehouse productivity by automating inbound and outbound logistics.